If you are finding it hard to perform simple daily activities like walking to your mailbox or climbing your staircase, it could be that one or both of your knees is severely damaged by arthritis or injury. You may ultimately even begin to feel pain while you are sitting or lying down. After assessing your particular knee damage, our physicians at Guilford Orthopaedic and Sports Medicine Center would begin treating you with nonsurgical treatments like medications and walking supports, but if these prove no longer helpful, you may want to consider total knee replacement surgery. Knee replacement surgery is a safe and effective procedure to relieve pain and help you resume normal activities. It involves removing arthritic or damaged parts of the knee and replacing them with a smoothly functioning metal, plastic or ceramic device. The vast majority of people who have total knee replacement surgery experience a dramatic reduction in knee pain and a significant improvement in the ability to perform common activities of daily living. 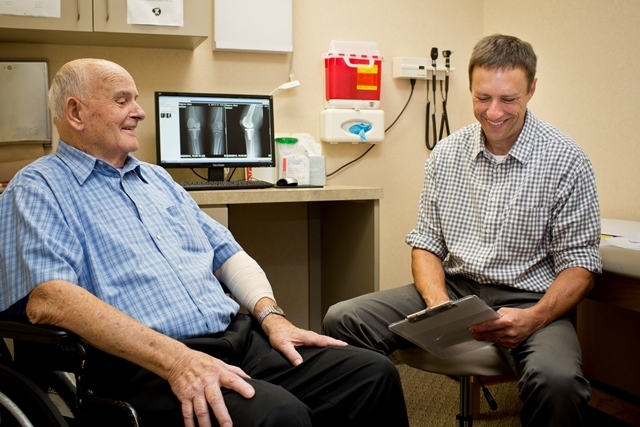 The physicians at Guilford Orthopaedic and Sports Medicine Center are highly trained in knee replacement surgery and will thoroughly explain the procedure to you. If you decide to go forward with it, they and our qualified staff of physical therapists will be by your side from beginning through recovery. Our goal is to restore your knees to full mobility. Read more on Total Knee Replacement by clicking here.